With a report to investigate, I needed to procure the actual sample. My sandbox report shows that the suspected Crypt0l0cker file is nearly 400 kb and likely a Nullsoft Installer file, which is a common packager. Static file information gives me the file hash which arms me with the ability to continue my investigation on VirusTotal. While the sample is clearly malicious, my VirusTotal inspection does not suggest that the sample belongs to any known family. No detections refer to Crypt0l0cker, TorrentLocker, a listed alias in the original Talos blog, nor Teerac. With a file sample in hand, and no static indication that I have located Crypt0l0cker, I move onto FIRST to discover how similar it is to known files. As the FIRST client code is an IDA Pro plugin, my first step was opening the file in my local IDA copy and allow auto-analysis. Upon completion, the start function was displayed in front of me at the graph view. 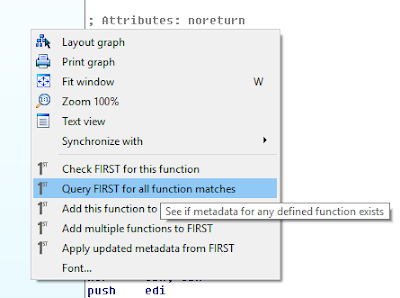 I opened up the graph view context menu and requested FIRST lookups for all of the discovered functions. 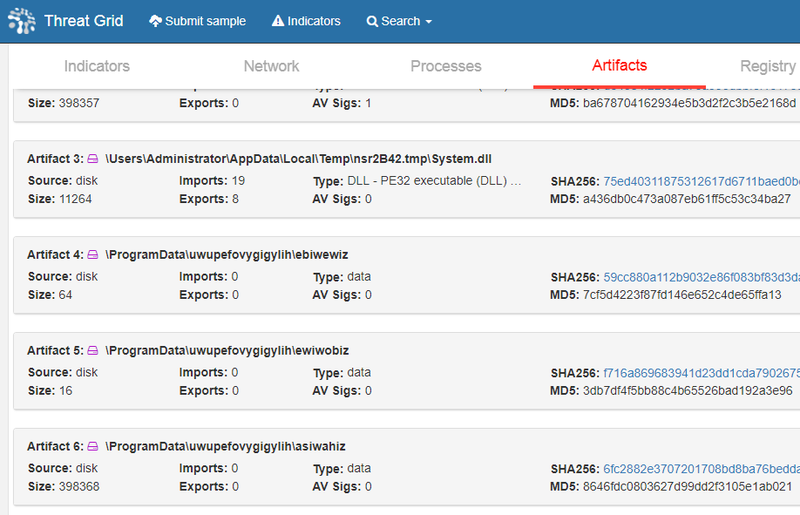 After a minute, the FIRST display shows that 13 of the functions have been previously identified and uploaded. Expanding the matched functions displays the metadata associated with that function, including a proposed name and function prototype. Notice that the files detected in this installer have been named to draw attention to the fact that these functions are known to be in NullSoft Installers. I had previously marked up a different NullSoft Installer before and uploaded significant functions from it to assure that I would not do so again. In general, a malware analyst is wasting any time spent inspecting such a file. Identifying when a packer is in use and moving along to the true payload is a much better use of time. Check the Select Highest Ranked checkbox and click Apply. 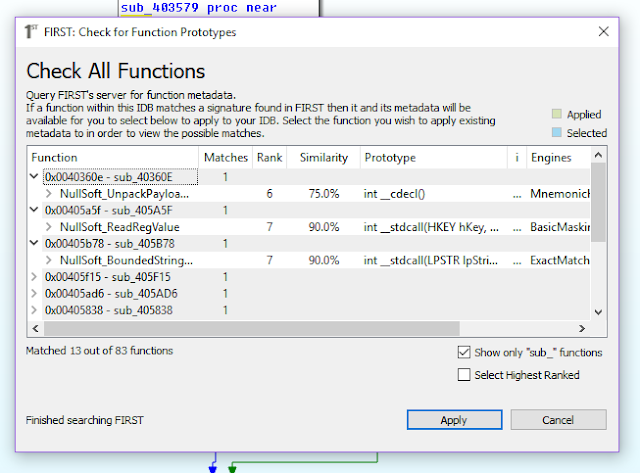 The function names get applied across the database and we can see clearly that the sandbox analysis was correct. This file is a packer and we need to extract the original. I admit that at this point I cheated to perform the unpack. 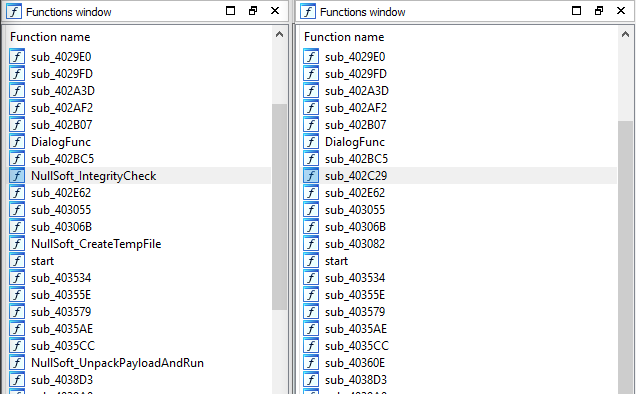 From previous extraction of Crypt0l0cker files protected with NullSoft I already knew that the install script consisted of consuming multiple encrypted blobs, internally decrypt the payload, and run it via Process Hollowing. As such, allowing it to run debugged and breaking on WriteProcessMemory should present the payload buffer to me. There was a complication though, because the install script loaded and unloaded System.dll many times. The ModLoad notification caused the debugger to consume the majority of the process cycles, effectively causing a denial of service against the debugger. I allowed this system to run for over an hour without getting beyond this delay. 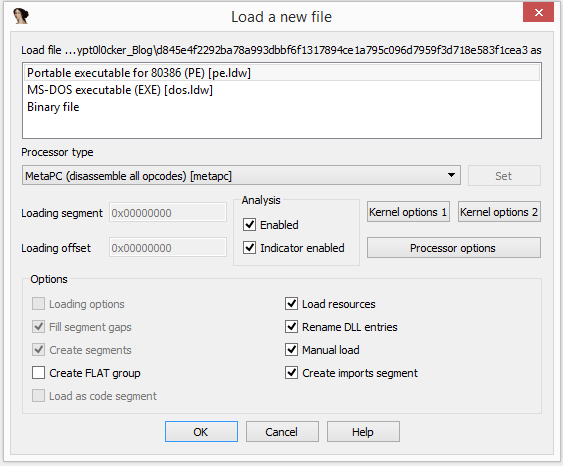 By disabling the ModLoad notification via `sxi ld` I could get my debugger to allow the System.dll file to be loaded without triggering the significant extra processing. Crypt0l0cker then was able to spike up to 99% of the CPU use to, rather than the debugger holding on to 80%. I dumped out the PE image file and prepared to continue with FIRST. 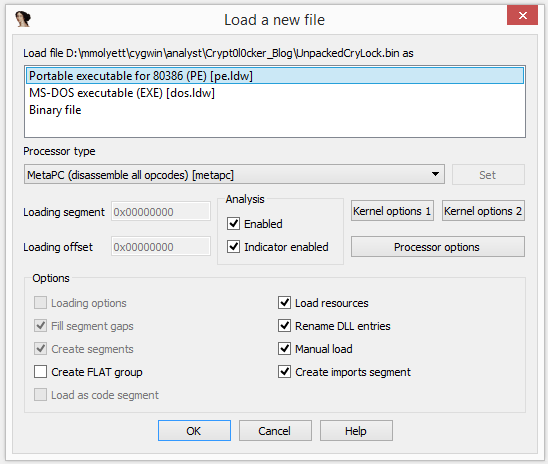 Again, the first step of using FIRST was opening the extracted file in IDA Pro. This file was built as a Windows GUI file on top of the Visual Studio C runtime. Thus, the runtime was identified during auto-analysis and I was left with a graph view displaying the _WinMain@16 function. Using the FIRST command from the context menu, I checked for the existence of metadata for just that one function. It was discovered as Crytp0l0cker_WinMain@16. Looking pretty likely that this is, in fact, Crytp0l0cker. With confidence that FIRST will be useful, since it had a result for _WinMain@16, I began the search for the full file. At 436 functions this is not a quick lookup, so go get a fresh cup of coffee and let FIRST work. Since this file uses a known runtime, the runtime files are also known to FIRST. 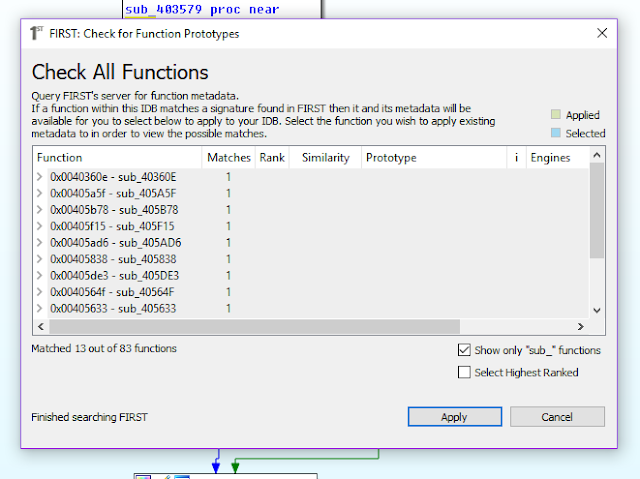 You can filter those functions with the Show only "sub_" functions checkbox. 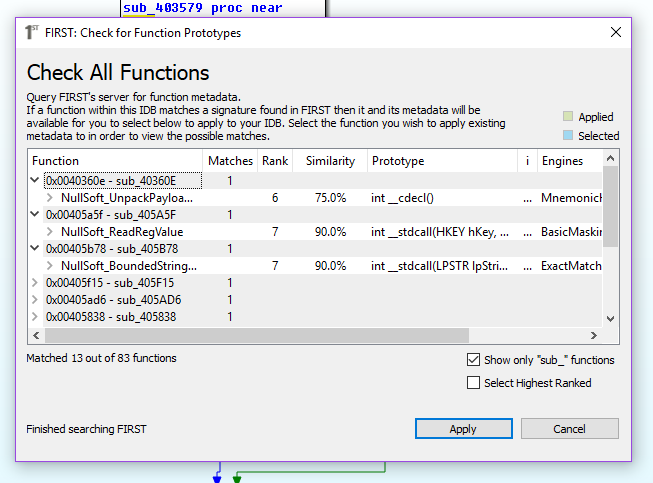 After FIRST completes 78 new function markups are applied out of 295 total known functions. With 78 Crytp0l0cker_* functions identified, you can now dig in on the shoulder of days of professional malware analysis. FIRST provides the ability to share your work from one file to a similar file, whether that other file is a previous or future version or even an additional step in the module execution. When opening up a new file, FIRST can provide hints as to whether the file is interesting or just needs to be unpacked. When finally extracting a new, embedded binary, FIRST can migrate your notes from the current file to the shared code in the new file. Use FIRST to save your notes, share your discoveries, and speed up your next analysis.